Yeah, let’s do this! I totally failed to get any scanning done today, but I did watch a couple cartoon movies on Cartoon Network yesterday, released in the last couple years. So I may as well quickly review them here while I’ve got a minute. 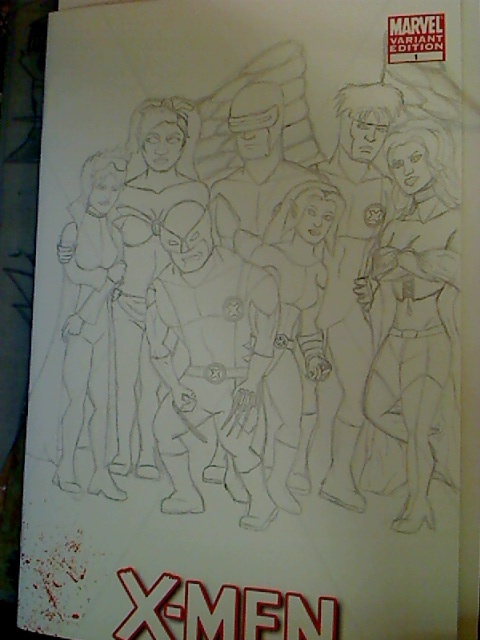 Going to try a little “Misunderstood Masterpieces” style for this one, so of course that means SPOILERS AHOY! First the bad movie: Scooby-Doo and the Samurai Sword. It was entertaining, but not usually for the right reasons. My dad & me had fun riffing on all the nonsensical things going on though. The story opens with museum curator Mr. Takagawa (Sab Shimono doing his Uncle voice from Jackie Chan Adventures, which we found absolutely hilarious) and pink haired janitor Kenji (Gedde Watanabe) running into trouble with The Black Samurai’s (Kevin Michael Richardson) ghost. Meanwhile the Scooby gang arrives in Japan so Daphne can compete in a (presumably) prestigious martial arts tournament. Along the way we meet one Daphne’s friend and the only character besides Daph that doesn’t come off as irritating and/or pointless in Miyumi (Kelly Hu). Seriously, even Fred and Velma don’t really do anything of note in this movie, especially the former. Scooby & Shaggy are pretty annoying too until they take a level in badass later on. They take a badass looking AI controlled jet (that never once goes out of control or breaks down, surprisingly enough) to the island dojo. Uncle Takagawa is already there trying to warn the head of the place, Miss Mirimoto (also Kelly Hu), of the Black Samurai’s reappearance. Once there, Daphne tosses Miss Mirimoto’s giant assistant Sojo (Also Kevin Michael Richardson) like a ragdoll. Then we meet others in the tournament, who do absolutely nothing of note besides getting their asses kicked by ninja (robots). Irish strongman and femme fatale with eyepatch are harmless if underutilized, but the guy that acts like a dog is painfully stupid and hard to watch. And guess who gets the majority of the screentime of the three… Anyway, Miyumi and Daphne have a pretty good fight followed by a little mind-boggling les yay between Daph and Miss Mirimoto I noticed three such les yay-ish moments, and they are glorious). At the evening’s feast the ninjabots attack and kick the other three’s asses and chase everyone around, to the worst music since that New Scooby Movies episode where Jerry Reed sang the same f***ing song 37 times in one episode. The music in this movie SUCKED, adding to the whole unevenness of the production. Anyway, after hijinks finished ensuing and Miss Mirimoto has a good but all-too-brief fight with the Black Samurai, who escapes with the scroll he was after. But then they go get the real scroll and figure out it’s riddle. We get the background on the Black Samurai’s legend, which was pretty cool actually. Then off in the cool plane to some random spooky island to retrieve his evil sword before he can get it and return himself back to life, narrowly escaping natives and the Black Samurai to get it, who crashes and burns revealing himself to be Sojo. Once they bring it back though, Miss Mirimoto inexplicably turns out to be the mastermind behind this and intends to revive the real Black Samurai, and captures our heroes, her reluctant student Miyumi joining her and Sojo. Seriously, totally out of the blue. I guess there were a couple of clues, but they were extremely vague. Anyway, Scooby and Shaggy escape with the Sword of Doom via Sojo as the Black Samurai’s jetpack, while Uncle and the rest of the gang are trapped in the closet with R. Kelly or wherever they are. After escaping back to the mainland and getting away from the ninja robots to more shameful music, Scooby and Shaggy crash in front of a sushi bar run by an old man (Keone Young) with a weird accent. As an aside, all the important Japanese characters speak fluent English, but not a damn one of them use even remotely coherent accents. Miyumi is generic youthful Asian woman, Kenji does the guy version, Miss Mirimoto is a generic villainous, Takagawa is Uncle from Jackie Chan Adventures who was Chinese, Sojo is mostly just gruff, this guy Matsuhiro seems to be vaguely channeling Bobcat Goldthwait, and George Takei’s brief cameo is with more of a British accent. Anyway, after a cringe-inducing line or three from Shaggy (including a “Me so hungry” when offered miso soup), the ninjabots attack again, and Matsuhiro grabs his sword and slices the sh*t out of most of them in a cool scene. The others get the Doomy Doom Sword and escape though. All that’s left to do now is to find the Green Dragon (Brian Cox) that originally defeated the Black Samurai and get his help to save the day. Shaggy & Scooby get a lil training from Bobcat and set off to find the dragon, who gives them the rest of the backstory, spiffy samurai gear, and his Sword of Fate, and flies them off to the resurrection site. Somewhere in there Kenji dopily came along and freed the gang and they headed off to try and prevent the resurrection. They watch from a nearby roof and see Miyumi show her true true colors, taking off with the sword in an effort to prevent the resurrection. Velma and Kenji MacGuyver up an EMP blast that destroys the pursuing ninjabots, followed by a much more powerful accidental burst THAT KNOCKS OUT ALL THE ELECTRICITY IN TOKYO FOR NO APPARENT REASON AND IS NEVER FOLLOWED UP ON. The baddies still get the sword back of course and the newly resurrected Black Samurai immediately turns on Miss Mirimoto and KOs her like nuthin’ (Sojo got knocked out by the resurrection itself, in his underpantaloons no less). He forces everyone conscious to bow before his awesomeness as the Green Dragon enters the sword and Shag & Scoob arrive/crash land on the scene. Another solid fight scene ensues as the startlingly competent duo put up a good fight until their inborn cowardice starts getting the best of them, leading to the funniest bit in the entire movie. Matsuhiro’s words of wisdom echo and they think it’s in their heads, but it turns out he’s standing on a nearby roof with a megaphone. Comedy gold. With their minds clear once more, they manage to break the Sword of Doom and it’s curse, freeing the Black Samurai and allowing him to die peacefully after he thanks them (Takei’s 30 second at most cameo from which he undoubtedly received several hundred thousand dollars for). Scooby gets a statue (calling back to the beginning of the movie), which looks to be made of cheese by the way, and we never find out what happens to Miss Mirimoto or Sojo. The gang offers to let Miyumi to travel with them, but she decides to follow her own path and as the only really good character in this silly mess of a movie besides Daphne, I’d much rather follow her down that path than watch another Scooby DVD movie any time soon. This was apparently Casey Kasem’s last run voicing Shaggy. This was also the last movie animated in What’s New, Scooby-Doo style. That’s all for this one, peeps. Stay tuned for my next post in which I take a look at Tom and Jerry Meet Sherlock Holmes (hint: It’s WAY better). It isn’t a new thought. I ask myself every time I fall behind on trades or don’t feel like posting for an extended period of time. I hadn’t thought about it for awhile, but ever since I read certain recent post by card blogging legend Night Owl, I can’t shake it. I think everyone that has gotten to know me a little bit here knows how scatterbrained and unfocused I usually am. And it does come through in my posting a little bit. There’s an opening chapter of a story and a couple stabs at poetry amongst my posts. There are a few random pieces of art, not to mention all those sketch cards. The last one related to the general cardiness of things, but it’s still just me showing off my latest card-sized artwork. And then there are two rarely ever touched post categories related to a couple of my other minor passions: video games and cooking. I enjoy the former when I get around to it and have largely untapped talent for the latter. I also quite like comic books/anime/manga/classic (as in good ’80s/’90s) cartoons/action figures, and hope to work in at least the first of those fields at some point in the relatively near future (ideally). I am a proud second-generation geek, what can I say? And though my overall interest ebbs and flows, I also like pro wrestling. I was such a fan in my youth that I actually wanted to be a wrestler, making this one of my longest standing dreams of the more unlikely variety. Heck, I even recapped TNA iMPACT! for a humor/tasteless satire wrestling website for close to a year back when the show first went to two hours. So yeah, I’m into all kinds of random shizz, and I am capable of doing almost anything reasonably well with little effort/practice. Not having to work hard to become knowledgeable or skilled at a fair amount of things has made me incredibly lazy-brained over the years, which leads me to constantly wander, looking for whatever new thing I can find to occupy my time when I’m not doing the usual things that continually, if not constantly, hold my attention. Lately I’ve been trying extra hard to learn how to sing decently, despite (or maybe because) music is the one thing I’ve always enjoyed that I have displayed nary a hint of talent for. I doubt it’s working in any meaningful way, but I’m rarely told to shut up when I do it anymore. Maybe the gravelly, bluesy voice I’ve been trying to find ever since I realized how gravelly my voice gets when I’m tired is working for me though, lol. Anyway, the point is, I’m always finding new things that grab my attention, and even things that don’t take for long rarely go away for good. So I’m constantly building up more and more things without ever giving anything up. A whim can hit me at any time to go check up on any little thing that has found it’s way into my focus at some point and I gotta go check it out, even stupid things I don’t like (*cough*government*cough*) but occasionally feel like I should get up-to-date on because I used to be (and maybe still am/could be again) borderline prodigiously intelligent. I feel like I could even write about those things with an above average degree of understanding and skill if I ever felt like it. So I guess maybe it’s supposed to be about the cards, but they can’t always keep my interest. I am what I am, so I will continue to do what I do, and post about whatever happens to be of interest to myself at any given moment. I hope it’s not something I lose any of my laughably small, but vitally important, readership over, but I have to be true to myself. And for me, that is what being true to myself entails. Cards will always be an important part of this blog, but I feel like I have more to say about a variety of things I enjoy and/or care about, so I’m going to start saying them. Hope you’ll still be there to tell me what you have to say. And after all of that, I should probably point out that I have tons of recently arrived cards to scan (and a Headliner to take a picture of) and post about. There are about four trades already arrived with at least one more on the way, all three group breaks have arrived, and I’m expecting over 60 cards that had been building up since late last year on Check Out My Cards to arrive in the coming week. Tagged blogging, confusion, issues, life and baseball cards, tough questions, what I do, Who am I?, Who I am. 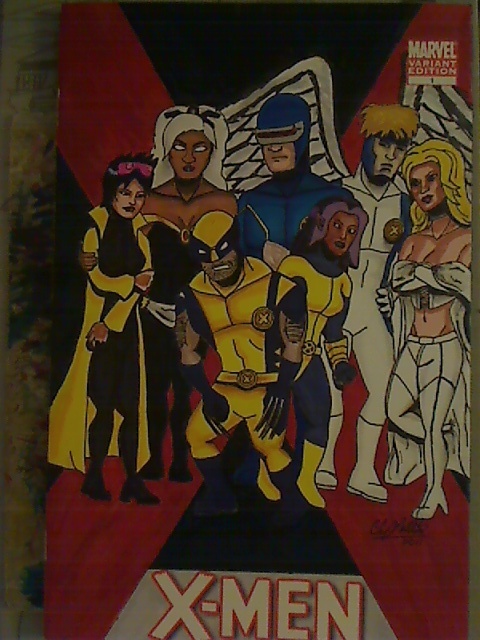 Colors Finished.. L-R: Jubilee, Storm, Wolverine, Cyclops, Pixie, Angel, Emma Frost. Whatcha think? Yep, my brother and a friend of his are working together on the new project called Digital Dialogue, or Digilog for short. So if you are into video games, go check it out. I’ll be here finally updating my For Trade page while you’re gone. The Diamond King Last Chance Contest Pimpage! There’s a new blog in town… that actually seems to have started before even my first six long since deleted posts from March/April 2008. But after a 27 or so month hiatus, The Diamond King is officially with us again, and is holding a contest to promote this most auspicious occasion. There are seven big ways to win big (well, six since that Ichiro Jersey card will be miiiiiiiiiiine), so if you haven’t already joined up, you still have about 24 hours to follow that link to do so. So do so, ya! Huh? What’s this? 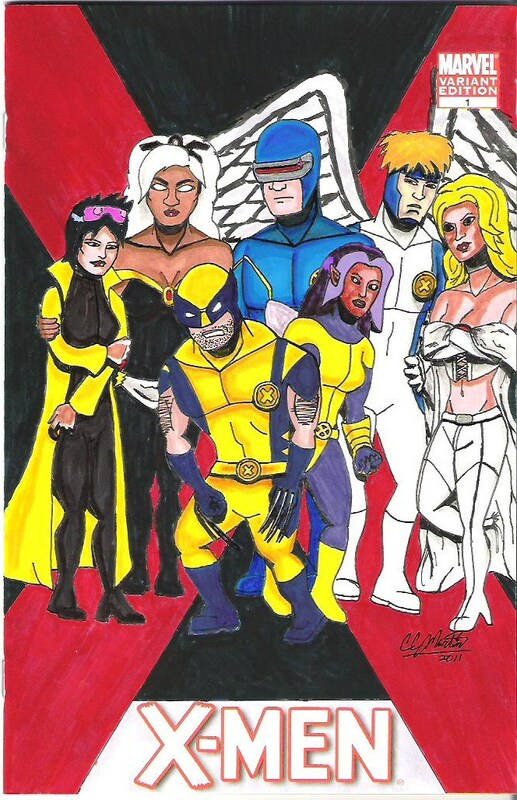 A post with recentish sketch cards completely ready to go? Did the blog fairy type this up when I wasn’t paying attention? No, I vaguely remember doing this myself for a rainy day. So seeing as it rained steadily all day today, let’s post it! All cards for sale or trade. 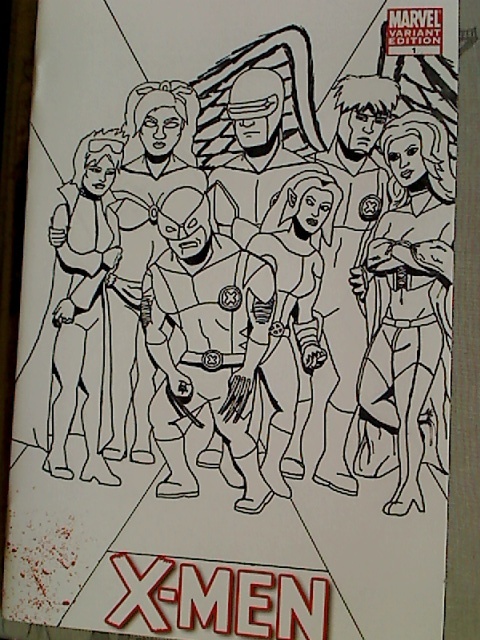 A scan of the Batum sketch card..
A really old card of Dawnstar (Legion of Superheroes) I finally got around to coloring. I kinda like how the super simple color job turned out. Only used about five different colors..
Jayna of the Wonder Twins and SuperFriends..
Now officially known as the "Ultimo Cup Card". Also, look! Random sunflower seeds!